As an emperor, Karl broke with centuries of ruling class norms in his decisions to pursue peace as his number one policy during World War I. When he ascended to the throne, Karl had already served his country as a professional soldier. He could have exploited his military career as many Kaisers did. He could easily have fanned the flames of conflict and stirred up his subjects by ranting against his political opponents and inciting people to fight. However Karl acted according to his strong moral convictions and Catholic faith. Karl declared that his priority was to seek peace. His words and policies made him a laughingstock. There was no end to the unflattering publicity he received from his political opponents in Europe and elsewhere, who constantly poked fun of him and dismissed him. His commitment to peace also irritated his German allies, who were eager to keep fighting. There was also much pressure for Karl to conform to his predecessors’ political standards among the Austrian court. For centuries, Kaisers had ruled as conquering warriors, attributed with deific characteristics. For a Germanic emperor, being aggressively warlike was perceived as a virtue. Emperors were unsparingly strict with subordinates and known for being harsh even to their own family members. They did not take a hands-on approach in relating to their subjects—instead, they customarily portrayed themselves as distant fatherly figures, always making it clear they were mighty and superior. They showed neither personal empathy nor mercy towards their enemies. Yet Karl, despite all of these pressures, did not change his position or retract his views. He did not deviate from his plan to treat all nations with respect and achieve peace, which he viewed as his responsibility to his people. 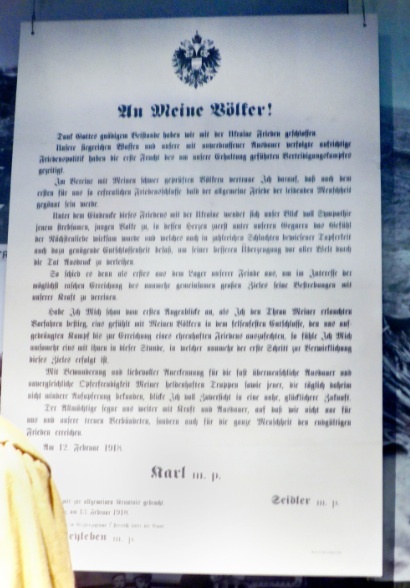 This proclamation written and issued by Karl in 1918 (below) demonstrates that Karl identified with his subjects and was personally engaged with ordinary people. He chose to walk a completely different path, abandoning the traditional role of “warrior” and “god-emperor,” and choosing to seek peace. Thanks to God’s gracious assistance, we have made peace with Ukraine. Our victorious weapons and our sincere peace policy, which has been pursued with unrelenting endurance, have reaped the first fruits of our defensive struggle which is being conducted for our self-preservation. In unity with my severely tested peoples, I trust that after this first and very gladdening peace agreement, the general peace for all of humanity will soon be achieved. As from the very first moment I ascended to the throne of my illustrious ancestors, I have felt united with my peoples in the self-evident resolution to fight our way out of this forced struggle until the achievement of an honorable peace, I also feel all the more united with them in this hour, in which the first step towards the realization of this goal has now taken place. With admiration and heartfelt recognition for the almost superhuman endurance and unparalleled spirit of self-sacrifice of my heroic troops, just as for those at home who daily make no lesser sacrifices, I look with full confidence to a near, happier future. May the Almighty continue to bless us with strength and endurance, so that we can achieve the final peace not only for ourselves and our loyal allies, but also for the entire humanity. Karl’s name also found its way unexpectedly into my life. I was named after Karl’s loving wife, Empress Zita, who supported him in everything and was always by his side. Empress Zita passed away a year before I was born. As a young adult, I read the life story of Karl and Zita. I was so deeply impressed with Karl’s strong character and selfless commitment to serving his country that I took his name for Confirmation, making my Catholic name “Zita Karlotta,” and resulting in me being named after both Karl and his wife. Although he was Austria’s last emperor, Karl shines out as a lone member of a powerful dynasty who dedicated himself not to rivalry or conquest, but to peace and goodwill towards all nations. He continues to go down in history not as an emperor of war, but as the Friedenkaiser—a ruler of peace.